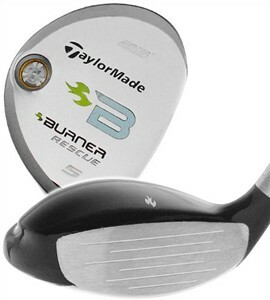 This is the lady's version of the very popular TaylorMade Burner Rescue Hybrid. As the name implies, the club is designed to rescue you from the trouble. I think you'll find that with this club, it is much easier to get the ball out of the rough then with your 3 or 4 iron. At address, the club should inspire some confidence because the club head is pretty big for a hybrid. However, it's not so big that it won't get through the thick stuff. This is because it has a shallow face with a low center of gravity. This lets the club maneuver through the grass, and the low center of gravity helps you get the ball up quicker and flying high. I recommend this club for all levels of golfers. I expect that you will throw your 3 iron and 4 iron in the lake after adding this club to your bag. Another comparable hybrid that I really like is the Callaway Big Bertha Heavenwood 09 Womens Hybrid. This is another very forgiving hybrid with a shallow face. Either one of these hybrids is going to give you some confidence and make the game a lot easier.